The Statue of Unity is a statue of Indian freedom fighter Sardar Vallabhbhai Patel. It is the world's tallest statue, with a height of 182 metres (597 ft). The statue inaugurated yesterday is located on a river-island facing the Narmada Dam near Rajpipla, 100 kilometres southeast of the city of Vadodara. Modi Government has been slammed for not inviting any opposition parties for the inauguration ceremony. 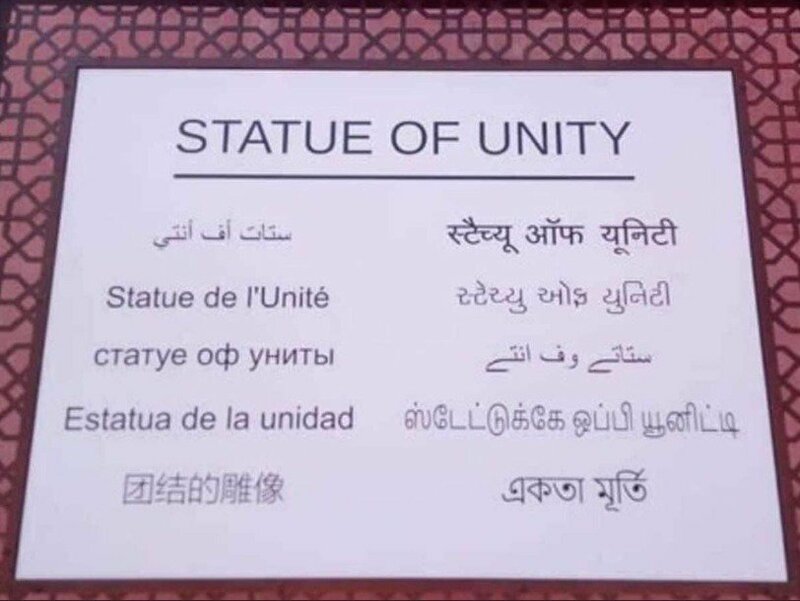 Meanwhile, a fake picture of plaque for the Statue of Unity where Telugu language was not included has been doing rounds since yesterday. Confused it as an original one, TDP leaders including the party chief Chandrababu Naidu and his son Nara Lokesh reacted to condemn Modi’s act. “As a Telugu person, I’m upset that the third most spoken Indian language, i.e. Telugu not getting recognition at #StatueOfUnity. Why the discrimination against Telugus? It is the right time for Telugus to express their agony,” said Chandrababu Naidu. “The Modi government has been successful in establishing the statue of Vallabhbhai Patel, the world's tallest statue. But Modi failed to save the united spirit of Patel. The BJP has once again dented Telugu self-esteem and ignored Telugu in form of unity,” said Nara Lokesh. Twitterati is trolling both Chandrababu Naidu and Nara Lokesh for reacting to a fake picture.